And that's because today's stitch comes from another mistake! The diagram below was my first attempt at diagramming this adorable window stitch, it wasn't quite right. It wasn't right because it didn't match the stitched sample, but it's still a cute stitch on its own merits. 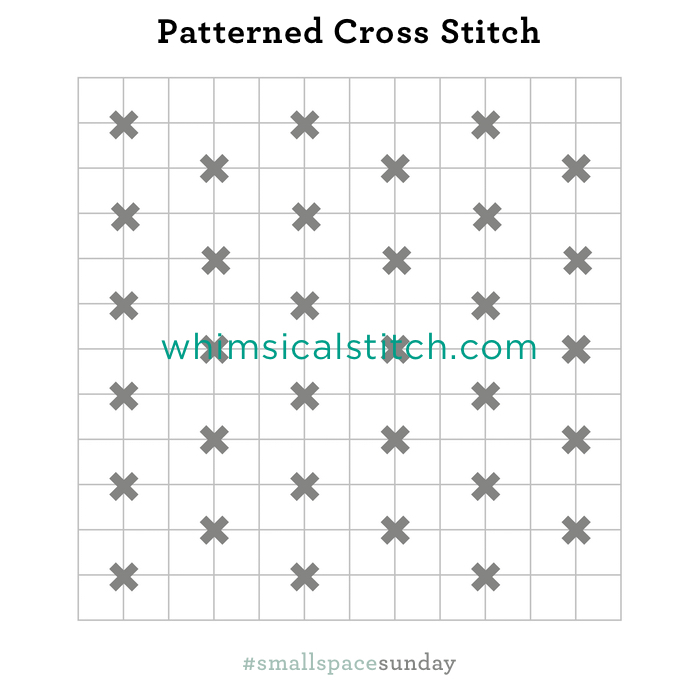 So meet the Patterned Cross Stitch's cousin, the Patterned Cross Stitch! My counsel for this version is the same as the cousin. Use it to help an area recede, such as a sky or a horizon behind a beautiful landscape, or to let how the canvas is painted standout. The pink area of this canvas was so cute that I didn't want to overdo it. It's also a foolproof way to highlight shading in a small area. A stitch like this is always top of mind for water or windows. I recommend using lightweight threads with a stitch this gentle. For example, the stitched sample uses Trebizond Silk on 18-mesh. Depending on what you are stitching, consider Petite Silk Lame, Silk Straw, 2-3 strands of your favorite silk floss or wool. 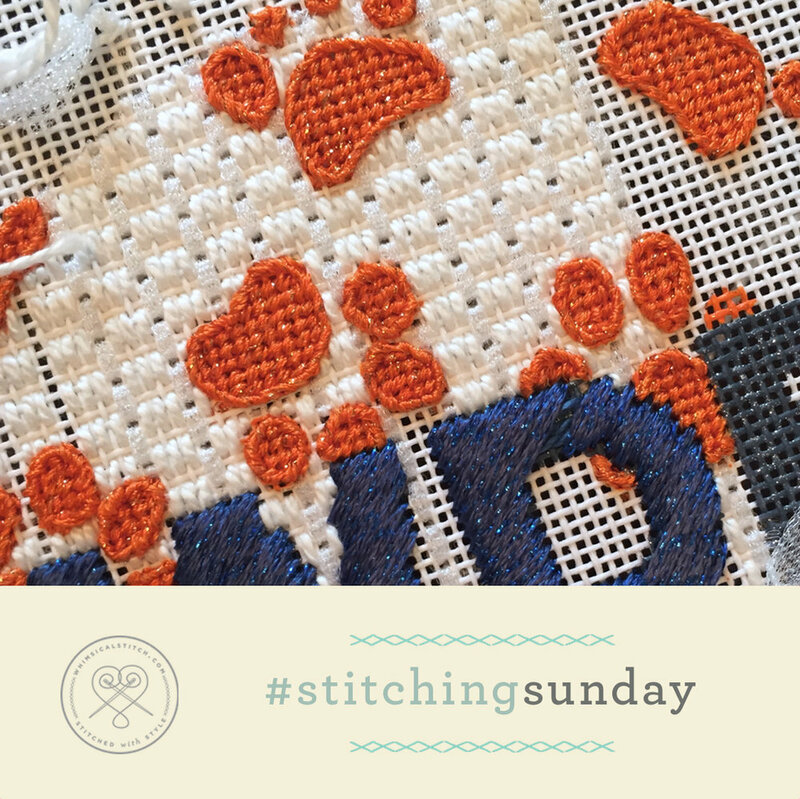 Welcome back to another episode of #stitchingsunday. 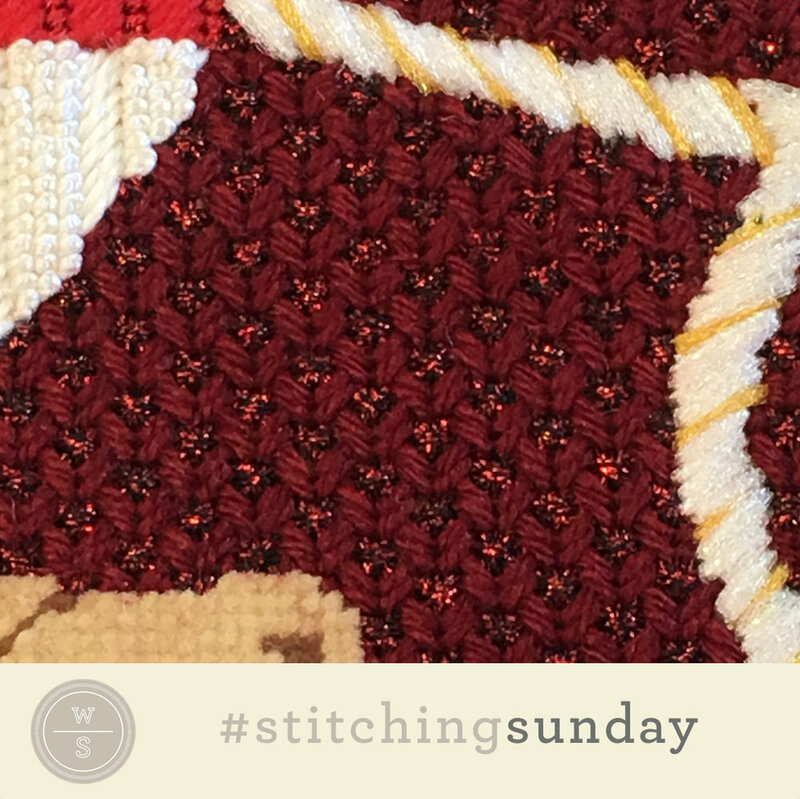 This recently added Sunday theme* highlights stitches from blog posts in current stitching projects. 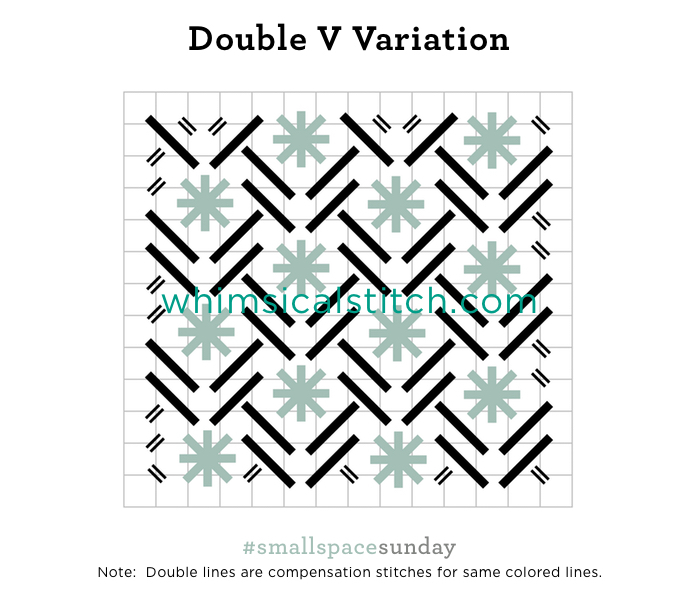 Today's #stitchingsunday uses a variation of the Double V Stitch I originally shared with you last April. I love the use of a Smyrna Cross instead of the Upright Cross. The stitcher used the stitch on a sweet Christmas stocking for her grandson. 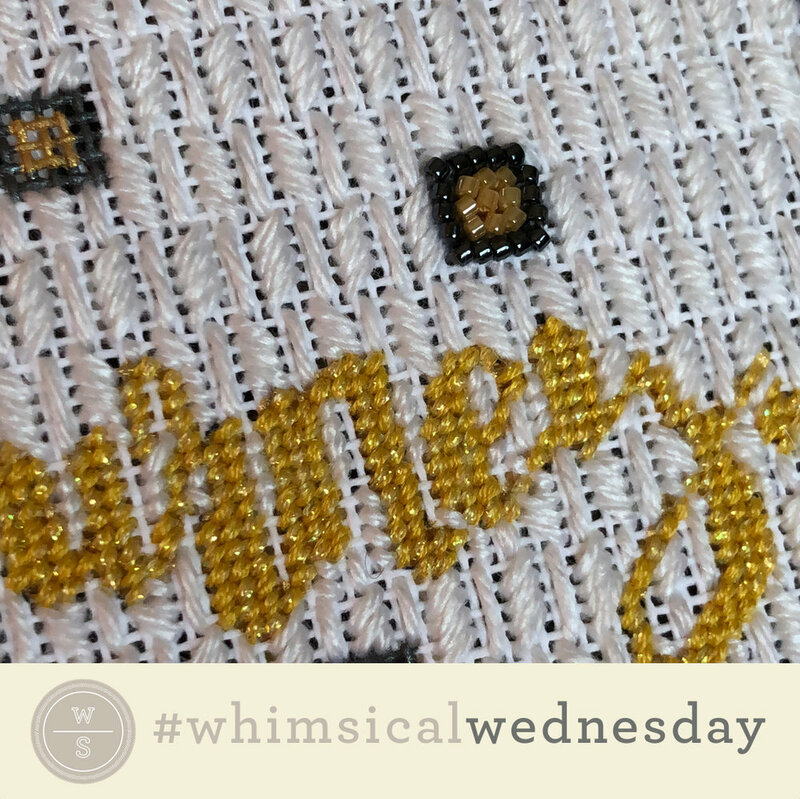 Today's example used Vineyard Silk and Kreinik Metallics Tapestry Braid (#12). 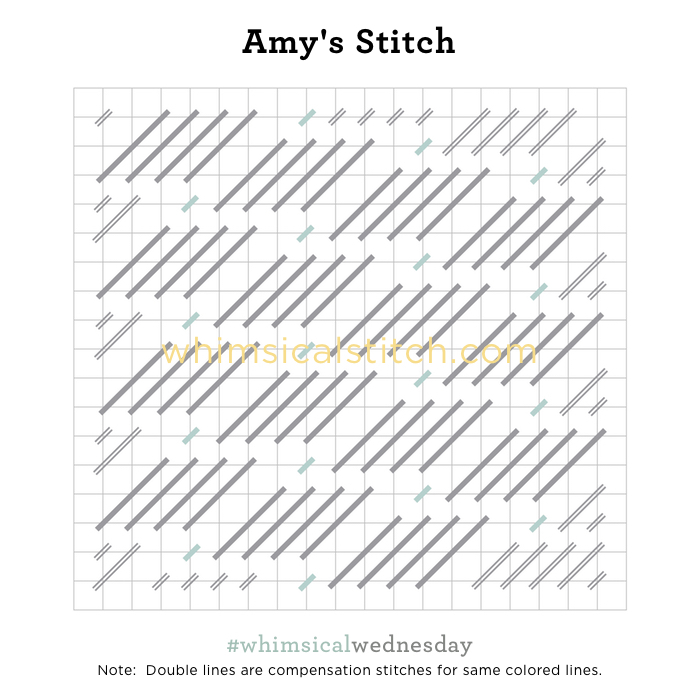 The original stitch diagram, as well as the variation, along with all other #whimsicalwednesday, #smallspacesunday, and #stitchingsunday stitch diagrams, can be found on a Pinterest board here. * Don't worry. #smallspacesunday hasn't disappeared. I like to mix it up a little. I always enjoy hearing when a reader shares one of my stitches was perfect for their project. What's more fun is to see how it is used. 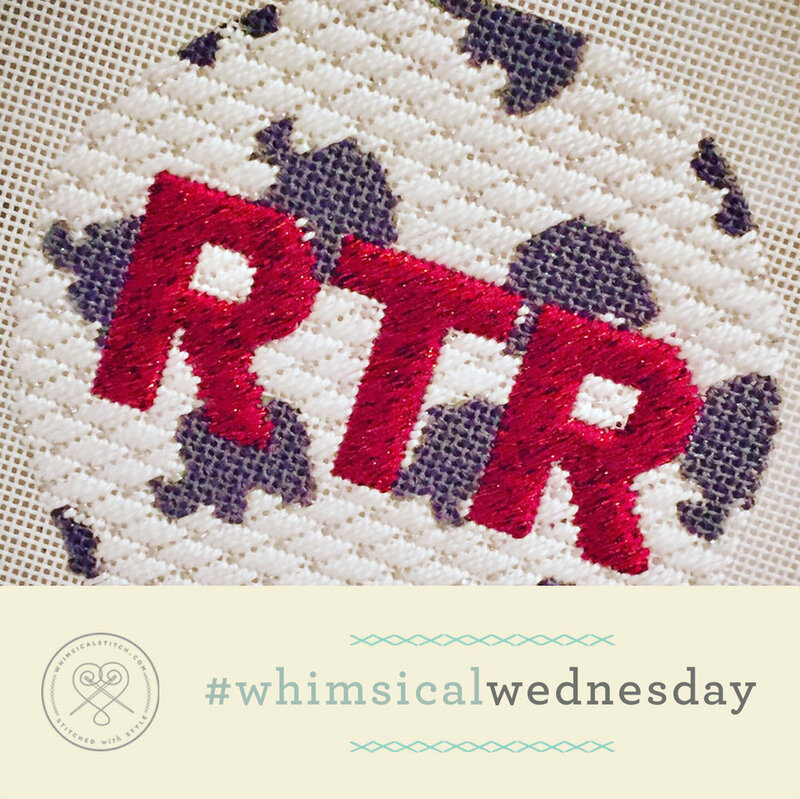 Today's stitch example uses the Darning with Backstitch and comes from Amy Poore. 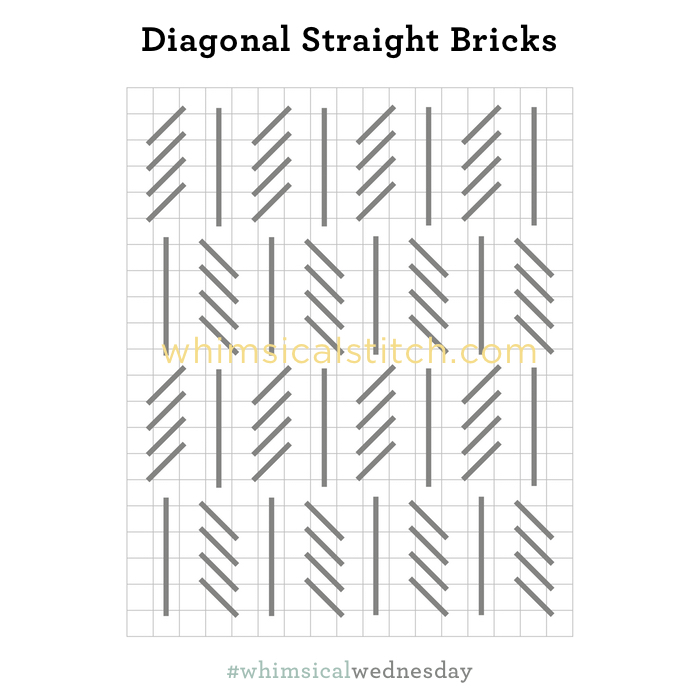 What is even better is that Amy used it for a background and on the vertical axis, neither of which I mentioned as possibilities in the original post. And I absolutely love it. Today's version provides more coverage with Perle Cotton and Flair. The horizontal columns would lend themselves to wallpaper, chimneys, fireplace mantles, tree trunks, pants...anything tall and/or narrow. * Don't worry. #smallspacesunday hasn't disappeared. I want to mix it up a little. Today's stitch and stitched sample come from a new whimsicalstitch.com friend, Amy Poore, of www.apooregirlpaintsneedlepointdesigns.com. Her designs are adorable and designed to appeal to a new generation of needlepointers. They are sweet and easy stitch pieces. Just like her designs, the background stitch is crisp and clean. The small accent and the skipped row are a delightful surprise. The stitched sample uses DMC Perle Cotton for the gray lines and Glisten for the accent stitch (gray lines). This stitch would work on so many areas. Of the top of my head, ideas include animal fur (with solid colored wool for the gray lines) and a variegated wool for the small accent stitch or a floor with two shades of Princess Perle. It would make an interesting stitch for a larger tree or even water. I just love stitches that have so many applications.